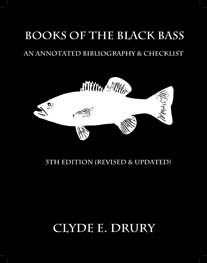 From Clyde Drury, the most esteemed historian of bass fishing since Dr. Henshall himself, comes the definitive work on published books on the bass. At nearly six hundred pages, this massive hardcover limited edition book contains descriptions of over 6,000 titles, including books, printed eBooks, booklets, pamphlets, technical papers, folders, maps and Bass magazines (including English, Africaans, French, German, Italian, Japanese, Korean, Portuguese & Spanish publications). Each title is fully annotated by Drury in his learned and affectionate style. Many pages contain illustrations. The product of nearly a half century of constant research and writing, it is the definitive work on the subject and will remain so well into the future. A fitting testament to a great man, this book is ab absolute must for bibilophiles, fishing historians, tackle collectors, and libraries. Clyde Drury passed away while this manuscript was being prepped for publication. Beloved by his friends and family, this book will remain a lasting testament to the dedication of a great man.